Over the years, Halloween is a holiday that has crept up on us. Pre-kids, Saathi and I gave out candy religiously and turned the lights out at about 8:00 PM. With the arrival of Ammu and Pattu, we gave in and got costumes for the kids and reveled in the pumpkin art they brought home from daycare and pre-k. We still stuck with the assumption it was just the candy. Last year dad and daughters sat on the floor, pumpkin goo on the newspapers below them. They scooped and eww-ed and peeyew-ed their way through while the engineer in dad carved and finished the edges with precision. I looked on indulgently, commenting and complimenting all the way to their new home on our patio. Frozen princesses roamed the neighborhood and our pumpkins sat on our stoop till they literally became a mass of goop sometime before Christmas. This year, we picked out costumes a couple of months ahead. We counted down to today. We joined in the community parade, decorated pumpkins, sipped on apple cider, devoured cider donuts and kicked off the festive season with much gusto. 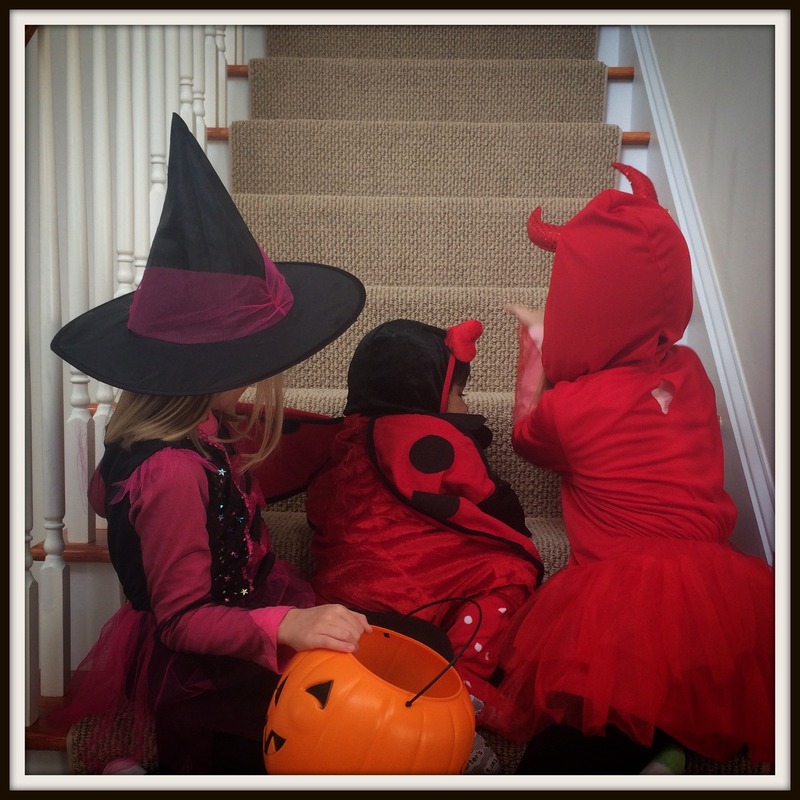 Laddu joined her sisters in her ladybug costume, a basket swinging from her chubby arms. Waving Saathi and the kids off, I settled in the semi darkness with two full bowls of candy waiting for the ghouls, goblins and princesses to stop by. They trooped in twos and threes. They almost always shyly muttered ‘Trick or Treat’ and picked just one candy. I wished them and closed the doors and waited for the next batch to arrive. The doorbell rings and I realize this year I know a good many of the kids who stop by. I urge one to pick up another piece of candy for her sister and she flashes me a coy smile. Another child stops to explain his costume is that of Antman. I boo the next trick or treater and am rewarded with introduction to the kids who are with her. I see ninja turtles, thing 1 and thing 2, bleeding zombies, six-foot teenagers clutching brown bags. I stop to chat with friends who are doing their rounds with kids in tow. I see a community come together. I see fire pits in driveways and marshmallows being toasted. Most of all I see the festive season descend on us in the darkness. Pagan origins or not, whether I believe in ghosts and the nether world or not, Halloween for me now represents an immersion into my local culture. As I don my witch hat and paint a spider on my cheek, I realize it is a day for revelry, a day to set aside who I am and don a mask and walk in the dark celebrating the anonymity of it all. “As I don my witch hat and paint a spider on my cheek, I realize it is a day for revelry, a day to set aside who I am and don a mask and walk in the dark celebrating the anonymity of it all.” – I love the play of words here.